The Holy Universe Call-in Book Club is a chance for you to converse and dialogue with me and your fellow readers of The Holy Universe. We’ll dive deeper into the writings and ideas in the book, dialogue about them amongst one another, and have a chance to ask questions that participants have about the book. The Book Club meets approximately every six weeks. Each session will cover one chapter of The Holy Universe; I’ll open the calls with a reading and some initial thoughts. Then we’ll break into small groups for dialogue around specific questions and then gather again in the larger group for further dialogue and questions and answers. Between calls, you’re also invited to stay connected in support of our work for sustainability, social justice and spiritual fulfillment via the Facebook group for club participants. You can Join the Facebook group now, if you wish. So please come meet some of your fellow Seekers and kindred spirits; my hope is that you’ll have another source of support as you find and fulfill your role in this Great Transformation we’re in the midst of. 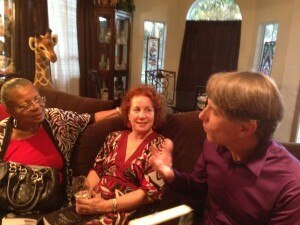 The book club is a “drop-in” event; that is, it’s not a requirement that you have attended any previous meetings. So please join us for the next meeting, which will be announced soon for the end of October/beginning of November. Please sign up for the newsletter for details about the next meeting, which will be on Wednesday, January 14th. You can also send an email to us letting us know of your interest.